Exquisite and distinctive waterfront home built by Edgar Smith. 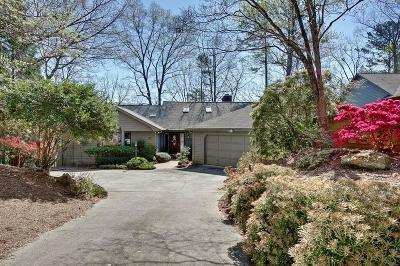 Nestled on a very private lot with sparkling views of Lake Keowee, this quality built residence balances elegance, comfort and warmth. Upon entry, you are welcomed by a soaring great room boasting exposed wood beams with a massive brick fireplace and lots of windows to admire the lake views. A large chefâs eat-in kitchen features an abundance of custom cabinetry, exposed wood beams, tile floors, a center island, breakfast bar and a spacious eating area creating the ideal space for entertaining a crowd. A screened porch which opens off of the kitchen provides the perfect place to have your morning coffee and enjoy the scenic water views all year round. The first- floor ownerâs suite is a dream with access to the upper deck, a spa bath with a walk-in shower, his and her separate vanities, an opulent soaking tub and a huge walk-in closet. Completing the first-floor is a private guest suite with a full bath, a den/library with handsome custom wood cabinetry, an oversized laundry room and half bath off of the kitchen. The terrace level is beautifully appointed by another family room complete with a brick fireplace, second kitchen and a bar eating area. The lower level deck is off of the family room providing easy access down to the lake. Two additional guest bedrooms with lake views, a full bath, two multi-purpose rooms, lots of storage and a cedar lined closet are also on the terrace level. The covered dock is on deep water in a protected cove located off the main channel. Thoughtful planning, innovative design, quality craftsmanship and attention to detail make this waterfront home unforgettable. Come live your dream at Lake Keowee!